Kyle Busch’s incredible from-operating-table-to-Victory Lane run continued Saturday when he won the NASCAR Camping World Truck Series race at Pocono Raceway. The start at Pocono Saturday was his first in a truck since returning from the Feb. 21 accident at Daytona that resulted in broken bones in his legs and kept him out of cockpits for three months. The victory was his fourth straight in a major NASCAR series event – the other three being in the Sprint Cup Series and XFINITY Series. Busch, who has also won three straight Cup races will go for a fourth in a row Sunday at Pocono. “It’s been unreal,” Busch said. “Those are the words to put on it. It’s unbelievable, remarkable, unreal and anything in the Thesaurus that works in that regard. It’s fun. I tell you, you just try to enjoy it as much as you can and working with my guys here Jerry Baxter (NCWTS crew chief), and of course Adam Stevens (NSCS crew chief) and Chris Gayle (NXS crew chief) on the XFINITY side. Busch needed several good restarts to win Saturday’s race – including three of the green/white/checkered variety. After the third of those three Busch crossed the finish line 1.225 seconds ahead of runner-up Kevin Harvick. Sweating while watching the late-race action was Baxter. He was sweating because he new his car was low on fuel. The victory was Busch’s first at Pocono in any series, and it marked the 10th straight year he has one at least one race in each of NASCAR’s top three touring series. Behind Harvick, Tyler Reddick ran third and snatched the series lead from two-time defending champion Matt Crafton, who was involved in an early race wreck. 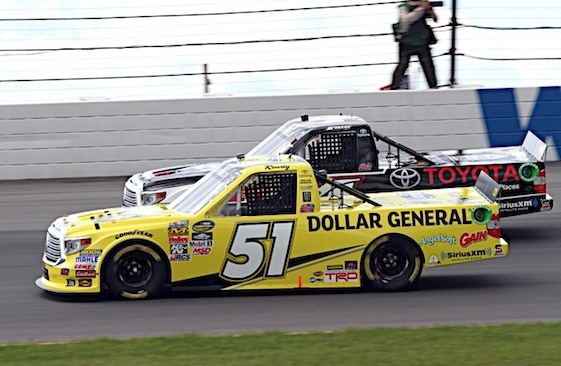 (2) Kyle Busch(i), Toyota, 69, $41542. (7) Kevin Harvick(i), Chevrolet, 69, $26768. (6) Tyler Reddick, Ford, 69, $27203. (16) Cameron Hayley #, Toyota, 69, $21817. (5) Austin Dillon(i), Chevrolet, 69, $16613. (17) Johnny Sauter, Toyota, 69, $16279. (12) Timothy Peters, Toyota, 69, $15725. (14) Matt Tifft, Toyota, 69, $15475. (15) Daniel Hemric #, Chevrolet, 69, $15420. (1) Erik Jones #, Toyota, 69, $18587. (8) Ben Kennedy, Toyota, 69, $15281. (11) Mason Mingus, Chevrolet, 69, $15141. (9) John H. Nemechek #, Chevrolet, 69, $15058. (13) Spencer Gallagher #, Chevrolet, 69, $15003. (20) Tyler Young, Chevrolet, 69, $15264. (18) Garrett Smithley, Chevrolet, 69, $14953. (10) John Wes Townley, Chevrolet, 68, $14643. (21) Jordan Anderson, Chevrolet, 67, $14503. (32) Kyle Martel, Chevrolet, 67, $14393. (25) Ryan Ellis, Chevrolet, 67, $12587. (23) Todd Peck, Chevrolet, 66, $11921. (30) Norm Benning, Chevrolet, 63, $14060. (19) Travis Kvapil, Chevrolet, 56, $13949. (31) Ray Black Jr. #, Chevrolet, Accident, 52, $12616. (26) Wendell Chavous #, Chevrolet, Accident, 51, $12727. (24) Jennifer Jo Cobb, Chevrolet, 49, $11533. (29) Korbin Forrister #, Chevrolet, Accident, 24, $11505. (3) Matt Crafton, Toyota, Accident, 13, $12258. (22) BJ McLeod, Chevrolet, Overheating, 12, $11229. (4) Brad Keselowski(i), Ford, Accident, 5, $10729. (28) Justin Jennings, Chevrolet, Vibration, 3, $9229. (27) Caleb Roark, Chevrolet, Suspension, 3, $8229. Average Speed of Race Winner: 119.607 mph. Time of Race: 01 Hrs, 26 Mins, 32 Secs. Margin of Victory: 1.225 Seconds. Caution Flags: 5 for 16 laps. Lap Leaders: E. Jones # 1-9; K. Busch(i) 10-31; J. Sauter 32-35; S. Gallagher # 36-38; K. Busch(i) 39-69. Leaders Summary (Driver, Times Lead, Laps Led): K. Busch(i) 2 times for 53 laps; E. Jones # 1 time for 9 laps; J. Sauter 1 time for 4 laps; S. Gallagher # 1 time for 3 laps. Top 10 in Points: T. Reddick – 479; M. Crafton – 468; E. Jones # – 463; J. Sauter – 420; C. Hayley # – 391; J. Townley – 387; D. Hemric # – 382; T. Peters – 380; S. Gallagher # – 366; B. Kennedy – 362.